Looks like Daddy Sarkozy is compensating for something these days. Check out these photos of him en pointe like a ballerina at the Bastille Opera! 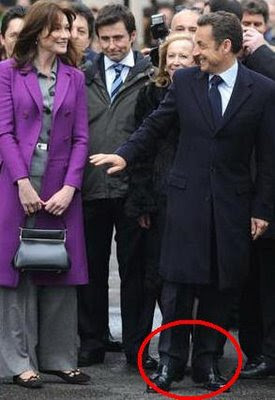 Daddy Sarko: Hey babe, could you scootch down just a little? Carla: Chéri, don't be such a coq -- I'm already wearing flats! He he he.... old habits die hard? He should just get it over with and get some heels, it would look better than standing on his tip toes all the time. lmao, that is so funny. Maybe he needs to talk to the person who makes Tom Cruise's shoes so he could gain a few inches!! Too funny! I wonder if someone told him to stand on his toes to make himself appear taller. Perhaps he should just get higher heels! !